Things remain busy here — still working on that diss. Have just finished the introduction, so I’m getting there. But now it’s Christmas, with all that entails, so the blogging here will remain rather perfunctory, but I wanted to at least get something up here and since I was just in Paris for a day and a half, here are some thoughts on the big Venetian show currently at the Louvre. It’s basically a much expanded reconfiguration of the Titian Tintoretto Veronese exhibition displayed at the MFA in Boston over the summer. That show was a focused if somewhat academic effort with an impressively high-quality selection of paintings. The Paris version includes most of those works, with a few notable exceptions, adds loads more and expands the scope to cover Jacopo Bassano and other artists of the late 16th century. So, lots of great paintings and well worth a visit, but is it a better show? Not really. The exhibition starts out trying to follow the Boston concept of charting the rivalries between the three major Venetian painters of the 16th century, but this quickly starts dissolving into thematically arranged rooms with banal labels explaining how the artists showed off their skills by painting reflections in armour, or how sacred scenes were often painted as nocturnes, etc. By the time Bassano is introduced, about halfway through, the storyline is wearing seriously thin, and by the end, after the waters have been muddied further by Palma Giovane, Lambert Sustris and other minor masters, it becomes clear how half-hearted the effort was in the first place. This would be fair enough had there been another idea, or if interesting points were made in the presentation of certain works, but it seems as if the curators mostly wanted to put together a blockbuster show for their autumn slot without much effort to communicate with the audience. The hang is largely uninspired, at times bordering on the pedantic; starting and ending with a Danaë by Titian — Naples (1545) at the beginning, Prado (1560s) at the end — is elegant but forfeits the much more interesting and audience-pleasing possibility of hanging these two masterworks next to each other. The same can be said of the missed opportunity of seeing the great 1559 Prado Entombment juxtaposed with its drier but moving c. 1520 Louvre predecessor, and the insensitivity of hanging Veronese’s two full-length Porto portraits, which were painted as pendants, opposite instead of next to each other, merely to preserve the symmetry of the hang. Or of hanging paintings one is encouraged to compare too high and on separate walls, as is done with three versions of a Bassano design. Really, I could go on, and besides, the lighting is uniformly too dim and in some places outright counterproductive because of the sheen it creates across the surfaces of the paintings, making some paintings very hard to see properly. Still, there was at least one inspired idea: the Rijksmuseum portrait of Ottavio Strada by Tintoretto and workshop (1567-68) is accompanied by an x-ray that shows how his right arm was originally positioned in the same way as, and probably in emulation of, that of his father, Jacopo — antiquarian to the Imperial court — painted by Titian at the same time, now in Vienna (which, again, is hung opposite rather than next to it). And of course, the paintings are largely wonderful. 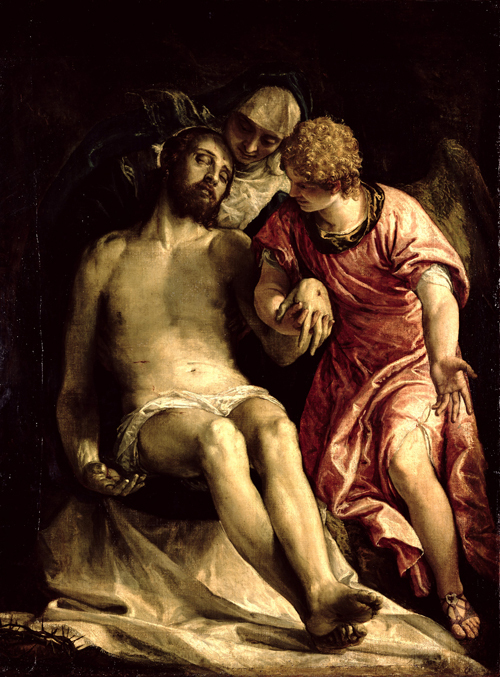 To this viewer, the St. Petersburg Lamentation over the Dead Christ by Veronese (late 1570s), which I’d never before seen in the flesh, was a minor revelation. Simple and solemn, the delicate rendering of fabrics — regal blue, delicate pink — and the sensitive way the Saviour is presented to us, his head resting against his mother’s cheek, the angel’s fingers braided into his, it encourages empathetic contemplation. While the motif was an old one, pioneered in Venice by Giovanni Bellini, the chiaroscuro rendering, which blocks out the noise of the surrounding world, seems to me a new development that has very little to do with Veronese’s mentor, Titian, and is only loosely related to Tintoretto’s high-contrast but also high-drama devotionals. The first stirrings of the paradoxically real theatricality of Caravaggio and the almost hyperreal elimination of all but the essential, spotlit object of devotion of Zurbarán and the Spanish masters of the following century. Rather than taking his cue from the Venetians, Veronese is here tapping into a Northern Italian tradition — perhaps Milanese more than anything — which Bassano also channels. 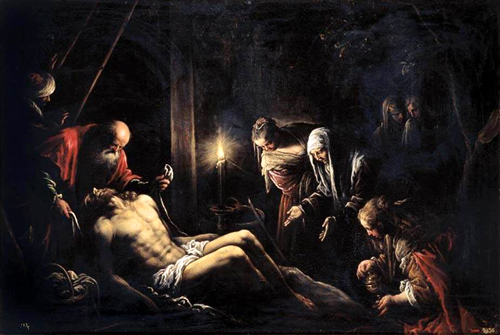 Next to the Dead Christ is Bassano’s breathtaking Louvre Deposition (c. 1580-1582), which though characteristically rustic in its texturing suggests a similar environment beyond timely reality, displaying the Sacrifice with equal amounts of outrage and reverence, shining a light in faith’s darkest hour. So yeah, by all means go if you can, and soon — the show only runs till January 4th. Also in the Louvre is a display exhibition of the museum’s fine collection of drawings by the Rome-based Venetian artist Battista Franco (c. 1500-1561), demonstrating the wide range of his draughtsmanship and the elegance of his sketchwork, which seems somewhat at odds with the stolidity and solidity of his more finished designs. It is expertly curated by Anne Varick Lauder and coincides with the publication of her sumptuous and substantial catalogue of the same collection, just published by the Museum press and unfortunately prohibitively expensive. All right, I’ve gone on long enough here, time to sign off. Merry Christmas!